§ 15. Now Cutheard died in the fifteenth year of his episcopacy; and Tilred, a man of excellent character, was become bishop in his stead. In the seventh year of his bishopric, King Edward died, and his son, Ethelstan, received the sceptre, which he wielded gloriously, and was the first of the English kings who governed all Britain. God granted him this by the aid and at the prayer of St. Cuthbert, who, when he formerly appeared to his grandfather, Alfred, promised him, saying, “The government of all Britain shall be bestowed upon your children at my request.” Lastly, the father of this Ethelstan, when he was about to die, began to recount to his son, what great acts of charity the blessed Cuthbert had done for his father; how he had bidden him leave the hiding-place where he had, from fear of his enemies, concealed himself, and again go to meet the foe; and how he afterwards gathered for him an army from all England, and, having without difficulty defeated his enemies, added the greatest part of Britain to his paternal kingdom, and ever from that time been his constant aider. 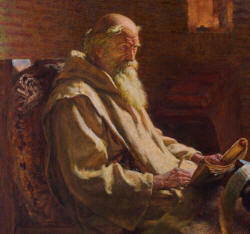 “Wherefore, my son,” said he, “show yourself obedient and faithful to this our great patron and bountiful preserver, not forgetting the promise which he made to the sons of Alfred, if they should exercise piety and justice, and be faithful in his service.” These were the instructions which Ethelstan received from his pious father, and as he heard them gladly, now that he was king he gladly fulfilled them. No king before him was such a friend to the church of St. Cuthbert, or enriched it with so many different and princely donations. Wherefore he universally prevailed in all his numerous conflicts with the enemy; and when he had either slain them, or reduced them to submission, or driven them out of Britain, he reigned with greater glory than any of the kings before him. In the first year of his reign, which was the nine hundred and nineteenth year of our Lord’s incarnation, was born St. Dunstan, who afterwards departed to the Lord in the seventieth year of his age, in the reign of King Ethelred. § 16. In the year of our Lord’s incarnation nine hundred and twenty-two, Tilred died, after an episcopacy of thirteen years and four months, and Wigred was elected bishop, and consecrated in his stead. In the tenth year of the latter, King Ethelstan, on his way to Scotland, at the head of an army collected out of all Britain, came to St. Cuthbert’s tomb to ask his protection, and make many presents, such as beseemed a king, to ornament his church; and these gifts are preserved in this cathedral of Durham to this day, as a record of this pious king’s devotion towards the holy saint, and to keep alive his memory for ever. Their nature and quantity will be found described in order in the charter long before mentioned. Besides these ornaments, he added no less than twelve estates, for the support of those who served in the church. The names of these are given elsewhere; therefore I do not think it necessary to state them in this place. He also ratified the laws and customs of the saint, which his grandfather, King Alfred and King Guthred had established; and enacted that they should be preserved inviolate for ever. Moreover, he uttered a dreadful malediction against those who, when an offering had been made, should presume to abstract or diminish aught therefrom; to wit, that on the day of judgment they should take part with Judas, who betrayed our Lord. Besides which the army, by the king’s command, bestowed upwards of ninety-six pounds of silver on the tomb of the Holy Confessor. Thus, when they had all commended themselves to the saint’s protection, and arranged every thing for their journey, the king departed, having first adjured his brother Edmund, that, if any reverse should happen to him in this expedition, he should bring back his body to be buried in St. Cuthbert’s church. After this he defeated Oswin, King of Cumberland, and Constantine, King of the Scots, and with a fleet and army ravaged and subdued the whole of Scotland. § 17. In the fourth year after these events, which was the nine hundred and thirty-seventh of our Lord’s nativity, he fought at Weondune, otherwise called Ettrunnanwerc, or Brunnanbyrig, against Onlaf, son of the former King Guthred, who had invaded the country in six hundred and fifteen ships, and had engaged against Ethelstan the help of the above-named kings of the Scots and Cumbrians. But the king, trusting to St. Cuthbert’s protection, defeated their countless host, expelled those kings from his dominions, and crowning his army with victory, showed himself terrible to his enemies, but peaceable to his friends, and finally departed this life in peace, leaving to Edmund, his brother, the sovereignty of his dominions. In the third year of this king, Wigred, having held his bishopric seventeen years, died, and was succeeded by Uthred. Meanwhile, King Edmund also, on his way to Scotland, visited the tomb of St. Cuthbert, in order to obtain his protection; and, like his brother Ethelstan of old, made royal presents of gold and mantles, and confirmed his laws as they were when they were the most favourable. § 18. On the death of Bishop Uthred, Sexhelm was ordained in his place. But he had hardly held the episcopal see a few months, when he was expelled from it by Cuthbert himself. For he turned aside from the path of his predecessors, and, instigated by avarice, afflicted the saint’s people, and those who served in his church; wherefore the saint appeared to him in a dream, and told him to depart as speedily as he could. But as he did not do so, the saint appeared to him again the second night, and threatened him with severe punishment if he did not go away immediately. The bishop, however, still lingered; and on the third night the saint appeared again, with his countenance much more terrible than before, and enjoined him instantly to depart, and to take with him nothing belonging to the church, threatening him with instant death if he should linger any longer. Then, indeed, on his awaking from sleep, his courage was broken, and, in fear of death, he hastened to depart, though he was not well. In his flight he arrived at York, where he recovered his health. Aldred ascended the episcopal throne in his stead. § 19. In the year of our Lord’s incarnation nine hundred and forty-eight, Edmund died, and was succeeded by his brother Edred, a pious and just man, who, like his brothers, made princely presents to the church of St. Cuthbert. On the death of Bishop Aldred, Elfsig became ruler of the church in Cuncacester. He was ordained at York by Archbishop Oscetil, in the time of King Edgar, who came after his brother, King Edwy. After Elfsig had held the bishopric twenty-two years, he died, and in his place Aldhun, a man of remarkable piety, was elected and consecrated bishop, in the nine hundred and ninetieth year of our Lord’s incarnation, and in the twelfth year of King Ethelred, who became king after the death of his brother Edward, who was miserably murdered by his step-mother. This prelate was of a noble lineage, but much more noble for his way of life, which was well pleasing to the Lord; and in his habits and acts he was a praiseworthy monk, like all his predecessors. Almost all the people of the country talk of his goodness, which they have heard of from their forefathers, as if he were still among them. § 20. In the nine hundred and ninety-fifth year of our Lord’s incarnation, and in the seventeenth year of King Ethelred’s reign, the same prelate, in the beginning of the sixth year of his prelacy, was admonished by an oracle from heaven, to flee as quickly as possible with the incorruptible body of the saint, and avoid the fury of the pirates who were at hand. He took it, therefore, with him, in the hundred and thirteenth year after it had been placed in Cuncacester, and carried it to Ripon, with all the people belonging to it. It is recorded as a singular fact in this flight, that out of so many, not a single one, great or small, was afflicted with any illness, but they accomplished their journey on foot, without any labour or inconvenience. And not only the men, but even tender animals just born, walked safe and sound the whole journey, without any difficulty. Three or four months after peace was restored, and they purposed to carry back the saint’s body to its former place; but when they came to Werdelan, on the eastern side of Durham, they found it impossible to make the vehicle proceed any further. The bishop, upon this, commanded the people to fast three days, and by watching and prayer to ask from Heaven an explanation of the prodigy. In consequence of which, it was revealed to them, that they should carry the body to Durham, and prepare there a place for it to repose in. Thus they brought it into Durham, and having speedily erected a little church of boughs, placed it there for a season. § 21. Now the aforesaid bishop, arriving at Durham with the saint’s body, found there a place strong by nature, but not easy to be inhabited, for a thick wood covered nearly the whole of it, save that in the middle there was a small plain, which they used to plough and sow. This wood was, with the aid of all the people, and Ucthred, Count of Northumberland, entirely grubbed up, and the place in a short time rendered habitable. The bishop then began to build a large church of stone. Meanwhile the saint’s body was removed from the little wooden church into another called “the White Church,” and remained there three years, until the larger church was built; and now the venerable Prelate Aldun solemnly consecrated that church on the third of September, in the third year after its foundations were laid, and transferred thither the body of St. Cuthbert, with all due honours, to a place which he had prepared for it. Thus the saint’s body, and the episcopal see, which was first founded by King Oswald and Bishop Aidan in the island of Lindisfarne, have remained in that place even to the present time; and from the year in which Aidan ascended the episcopal chair in the island of Lindisfarne, to the year in which Aldun ascended the same in Durham, is computed to be three hundred and sixty-one years, and three hundred and nine from the death of St. Cuthbert. § 22. On the death of Aldun, the church was almost three years without a ruler; after which Edmund, a man famous for religion and activity, was elected; the priest at the altar, and the deacon who was attending on him, having said that they heard a voice which seemed to come from the holy father’s tomb beneath the altar, and ordered that he should be made bishop. During his episcopacy there flourished in the church of Durham a priest, named Elfred, son of Weston, a man of great piety, and good works, who also was familiar with the holy Cuthbert. He had showed himself entirely devoted to the saint, was a man of much sobriety, a frequent giver of alms, constant in prayer, an enemy to the wanton and licentious, respected by the good and by all who feared God, and one of the most zealous supporters of the church. He had in his possession a hair of St. Cuthbert, which he used to show those who visited him, and in consequence to increase the admiration of those who already admired him for his sanctity. For he would fill a censer with burning coals, and place the hair upon the top, but it would never be consumed, for it became white, and shone like gold in the fire, and after staying there a long time, when taken off it returned gradually to its former appearance. Not only many of his disciples affirmed that they saw this miracle, but also a certain brother of this monastery, by name Gamelo, a simple and humble-minded man, who now sleeps in the Lord.